BRP unveiled its 2018 Lynx lineup in front of hundreds of its dealers and invited guests. The 2018 Lynx snowmobile lineup is the 50th model year created by Lynx and is introducing the new Radien platform, the next generation of Rotax 850 E-TEC engine and the ultra-lightweight E-TEC engine starting system, SHOT. The new Lynx Radien platform will be introduced on the 2018 Lynx BoonDocker, Xtrim RE and Rave RE models. The new models are lighter, more agile and include new innovations, such as the short Radien DS tunnel system on the Lynx BoonDocker DS model. “The new design is most prominent in the completely redesigned Lynx BoonDocker DS model. It looks radical, but most importantly it greatly combines power, stability and agility”, says Valto Ristimella, Commercial Director, BRP Scandinavia. The models offered with the new Radien platform are powered by the Rotax 850 E-TEC 2-stroke engine. It unleashes 165 horsepower and riders will also appreciate its 30% quicker response, which instantly delivers the power. This new powerplant provides one of the best power-to-weight ratio in the industry. 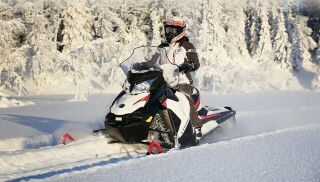 Still, snowmobiles maintain impressive fuel and oil economy equal to the Rotax 800R E-TEC engine. SHOT is an ultra-lightweight E-TEC engine starting system which introduces ultracapacitor technology to the industry. This system provides an electrical charge with no battery, starter motor or ring gear to start the engine. 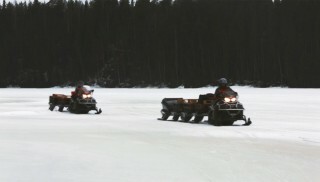 The system will be most appreciated by deep snow riders who want to conserve energy by no longer pull-starting their sleds. It also saves weight, as SHOT adds only 900 grams. “With SHOT, we are once again bringing to the market an industry-first invention created by our engineering teams. 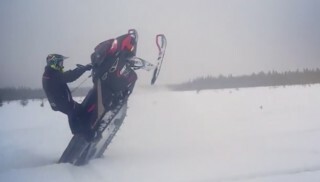 I’m convinced it will become a benchmark in the snowmobiling industry,” said Pelletier. To celebrate the 50th anniversary, a special model, the Lynx Commander 5900 snowmobile, and a clothing collection have been specifically designed. “We are thankful to the many generations of loyal Lynx customers and invite them to celebrate this great milestone with us using the tag #lynx50. We will also tell the Lynx story in a special video series that will be revealed this year”, concludes Valto Ristimella.